he film tells the story of Dumbo who was born with a wide ear that could make him fly. Dumbo was born in the circus. The film shows his journey finding his real home and accepting himself. Adapted by Disney’s animated film Dumbo in 1941 who was adapted by the story Dumbo by Helen Aberson and Harold Pearl. Colin Farrell played as Holt Farrier; a former circus equestrian while Michael Keaton as V.A. Vandevere. Danny DeVito as Max Medici and Eva Green as Colette Marchant; a French trapeze artist. While Dumbo is a complete CGI animation with creature performer Edd Osmond who used a green suit to represent the character movement which later Burton took to the animation team. The film is more colorful than any of Tim Burton’s film. Looking at the trailer, expectations are high. But instead, the film turned to be just fine. There’s not enough spark that could make the film memorable. The film is perfect for watching with the whole family, but the film is not gonna be in someone’s best film list. 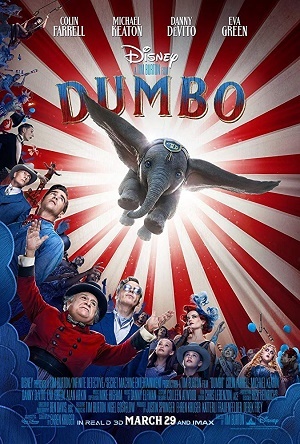 The best part of the film is how Dumbo is actually flying. It takes our imagination is to another level. Applause to all the animation team. The CGI of dumbo cannot be expressed in words. Dumbo is shown very alive with very deep eyes that shows its feeling. Eva Green gives a good performance as Collette and applause to Nico Parker who played as Milly Farrier; a star on its way. The character of Milly and Holt (Finley Hobbins) gives the film more color. The film is expected to be a box office success but instead the result is not that big. One point of disturbance in the film is how the circus hurt the animals, which is unpleasant to watch. Even though in the end there are basically no animals that are being tortured in the film. The film messages are pretty good which is finding your home and accepting yourself no matter how unique you are and hearing this from Milly and Holt character is excellent. The film could be more meaningful and more scenes that could put more depth into the film or probably just the expectation that is too high.